Classical music personified would be a pack rat, forever accumulating history — compositional history, stylistic history, performance history. To the art form’s discontents, that hoard is a burden; to its proponents, though, it is a ready supply. Friday’s Celebrity Series concert by pianist Marc-André Hamelin, violinist Anthony Marwood, and clarinetist Alexander Fiterstein (the last of a Hamelin-curated three-concert series this season) capitalized on that abundance, rummaging around the repertoire to come up with just the right accessories for a bit of history. Half the program — Claude Debussy’s “Première rhapsodie” and Violin Sonata in G, and Béla Bartók’s “Contrasts” — also featured on a 1941 Celebrity Series concert with Benny Goodman, Joseph Szigeti, and Bartók himself at the piano. Friday’s concert matched those works with complements and critiques. Even the most distant cousin — the opener, Franz Schubert’s D. 895 Rondo for violin and piano — became dazzling stage-setting: a flourish of dotted-rhythm gravitas giving way to propulsive dancing foreshadowing Bartók’s folk-derived actuations. The Schubert’s big, bravura performance — old-school sound and sizzle — was followed by the watercolor haze of Debussy’s “Première rhapsodie,” with Hamelin and Fiterstein (a late substitution for an injured Martin Fröst) slipping in and out of a luminous fog of glassy clarinet and rippling piano. The score showcased Fiterstein’s tonal control — coolly smooth and polished in all registers — and Hamelin’s saturated touch — from hushed clusters to hammered accents, one always feels that Hamelin is drawing the maximum amount of color from the instrument. Like the Schubert, Igor Stravinsky’s “L’Histoire du soldat” suite anticipated the Bartók, though in a more precociously smart-alecky manner: all self-consciously stylized rusticity. (One could compare the story of physicist Enrico Fermi, ensconced at Los Alamos during World War II, bringing his full analytical prowess to bear on mastering square dancing.) The trio’s performance was nonstop aplomb, such that the piece’s duel-with-the-devil plot was, in the end, a bit one-sided. 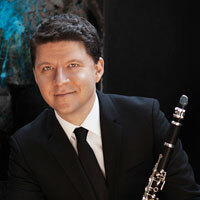 Fiterstein’s second-half turn was more showy — Francis Poulenc’s 1962 Clarinet Sonata (premiered, after Poulenc’s death, by Goodman, another congruence pulled from the historical stream) — though his cultivation of the instrument’s capacity for understated eloquence remained paramount. Marwood’s refinement and detail suffused Debussy’s late, classicized Violin Sonata, which, like the “Rhapsodie,” dramatically punctuates mostly ruminative music, turning over and considering aphoristic bits of lyricism. All roads led to the deft, feisty marvels of Bartók’s “Contrasts.” The trio gave the first two movements a luxurious restraint, the “Verbunkos” (“Recruiting dance”) assiduously casual, “Pihenö” (“Relaxation”) exactingly languid. Not so the finale, “Sebes” (“Fast dance”), which was very fast indeed, an unabashed excess of virtuosic energy. The best performers keep plenty of technique around; after all, you never know when you might need it.